Rowan Curnow is not exactly a stranger. Not quite a gentleman either, class disparity once kept him from courting Elizabeth . . . even if it didn’t keep him from kissing her. The couple elude their pursuers and reach Bastian Point, Elizabeth’s future inheritance and the one place she calls home. But in the very act of spiriting her to safety, Rowan has jeopardized Elizabeth’s inheritance—if her Grandfather ever learns she spent the night, however innocently, in the company of a man. When smugglers unite the pair in a reckless, flirtatious alliance—an alliance that challenges the social norms that Elizabeth has been raised to revere and rattles Rowan’s fledgling faith in God—Elizabeth must choose between the obedience of a child and the desires of a woman: whether to cling to the safety of her family home or follow the man she loves. Elizabeth Trelawny flees London when she is forced into an engagement with a dangerous man. She reaches Bastion Point, her grandparents home, with the help of Rowan Curnow, a mysterious man who claims to have been sent by a friend to protect her. But Bastion Point is not the safe haven it once was, as smugglers in the area have deemed Elizabeth a threat. Rowan will do anything to protect her, but Elizabeth can’t believe Rowan’s interest in her is anything more than material, as her years in London society have hardened her heart. Will she survive when enemies come knocking? And will she finally give up being the “ice maiden” and learn what unconditional love truly is? I’ve read a few books from Laurie Alice Eakes and they have never failed to entertain me. So I was very excited when her new book came out! 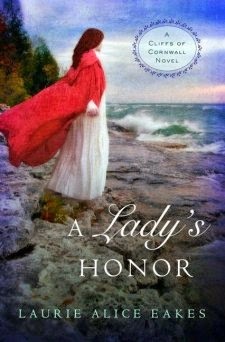 A Lady’s Honor has some great elements; it is romantic, suspenseful, and historically interesting. The mystery was great! It’s a rare thing when I don’t guess the entire plot in the first few chapters and I was dumbfounded at the end when everything was revealed! The only thing is, I was severely annoyed by Elizabeth. It’s kind of hard to fall in love with a book when you just don’t like the main character. However, by the end she was more likable. The best part of this book was the message of unconditional love. Elizabeth’s struggle to accept that God loved her despite her mistakes and that maybe Rowan did too was very touching. Overall I thought A Lady’s Honor was an entertaining historical read and I am looking forward to more from the series. If you like mystery, suspense, romance, historical fiction, and a good message then this is the book for you! **I received this book free from BookLook Bloggers in exchange for my honest review. All thoughts are entirely my own.